The fengshui bowl with tortoise been a symbol of wealth and good luck in China since ancient times. Embossed with good fortune symbols this crystal Fengshui Bowl with 2 tortoise makes a perfect decore for dining room to symbolize prosperity, wealth, abundance and success. 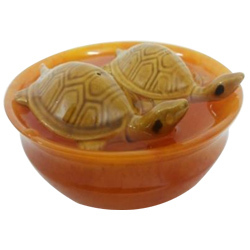 The best place to put this Fengshui Bowl with 2 tortoise is the living room to remove the negativity from surronding.The Feng Shui Bowl Set makes a perfect gift to express good wishes for friends and relatives.